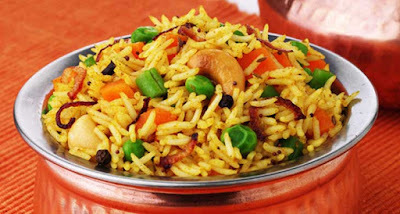 A healthy and delicious biryani with vegetables and rice.Vegetable biryani is a traditional mughlai main course item loaded with chopped vegetables, spices, saffron and dry fruits. Veg Biryani is an everlasting relic of the Moghul era that continues to live and breathe in innumerable restaurants and kitchens across the globe. Not only that, this traditional recipe has stood the test of time by being constantly adapted to suit the tastes of each generation. While many modern versions of this spice-filled rice preparation are made in the oven or microwave, here is a recipe that retains the original handi cooked magic. Layers of rice and vegetable gravy are topped with an aromatic saffron mixture and simmered on the stove till the aroma multiplies and wafts out, to fill the room and the hearts of the diners! Enjoy it hot and fresh, with raitas / kachumber or a white-gravy based side dish like paneer In White Gravy . Add the ginger-green chilli paste, turmeric powder, coriander powder, chilli powder and garam masala and Saute on a medium flame for a few seconds. Combine the curds, coriander and saffron color in a bowl and mix well.